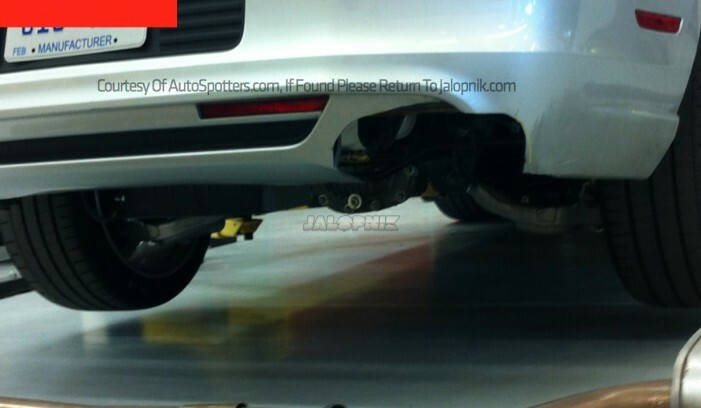 New Spy Photos: The 2015 Mustang WILL Have an Independent Rear Suspension! Finally. 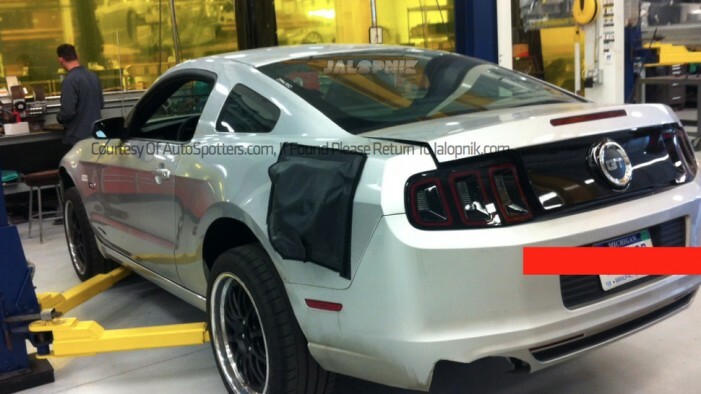 Fresh spy photos of the 2015 Mustang are starting to roll out, helping to confirm many of the strong rumors we’ve all been hearing over the past two years. These snap shots provided by Autospotters to Jalopnik show a current-day Mustang test mule hiding the guts of a 2015 Mustang. Chalk this up as Exhibit B of the 2015 IRS Mustang proof file as we’ve already caught photos of an IRS in a 2015 test mule in the past. Judging by the photos, it also looks like the guys at Ford might have a few more changes up their sleeve. It has been a little while since we’ve had concrete news on the 2015. We hadn’t heard a peep since a Car and Driver employee claimed to have gotten the inside scoop on Mustang’s motor lineup and new EcoBoost option(s). This news should lay to rest any doubts the solid axle holdout may have had about the 2015 leaving behind the archaic solid rear axle. Getting the last needed confirmation on an IRS for the next generation Mustang may keep the saber rattling at a high, but at least we know what’s coming, like it or not. What Else do These Spy Photos Tell us? With the question of credibility bound to come up, it’s important to point out these photos show a Michigan manufacturers plate, the same type of plate on the earlier KGP spy shots. The consistency of these photos with all of the previous 2015 spy shots and test mules we’ve seen indicate these are, in fact, real photos of a next generation Ford Mustang. All of the spy photos that have surfaced include a special cutout in the rear bumper to allow the exhaust to be routed around the IRS. Also interesting is the shape of the cutouts–a wide, boxed cut that is prevalent on all the 2015 IRS photos we’ve seen so far. 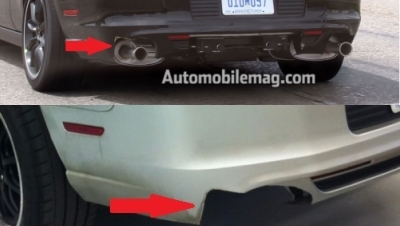 Could this be due to Ford test fitting the GT500’s exhaust tips on the 2015 S550 platform? It’s possible, and the abnormally large shape of the cutouts on the test Mustangs seem to indicate this being the case. One last thing these photos point out is the inevitable future–the Mustang is going global. The new spy shots show a wider area for the license plate (European plates are much wider) and a potential location for rear fog lights, a requirement under European traffic laws. Comment and let us know how you feel about the 2015 Mustang receiving the first IRS since the 2004 Cobra. Previous Entry AmericanMuscle’s Mustang Mayhem Dyno Event is Here! It’s about time the Mustang grew up and became a true GT (Gran Touring) car. Anyone who thinks the IRS can’t handle hard launches should try driving a Z06! I have a 2011 and I’d trade it in a minute for a 2015 with an supercharged V8, paddle shifting 8-speed and an IRS. Like the new Jaguar. Oh I cant wait… I was almost going to buy a 2014, but im defiantly going to wait for the 2015 50th anniversary. I wish we had more info on this baby!!!!!! and +1 rickycardo, my dad has a zo6 and that thing launches HARD, only thing is there’s wheel hop in the rear end if you hit a bump on the road, but if you cant deal with that then you shouldn’t be driving. this car sounds like it will be sick :). just wish we could see what that front end will look like. I thought the first Mustang was in 1964 which would make the 2014 the 50th anny version. it came out in april of 64, but it was model year 65, so when the 2015 comes out in 2014 it will be 50 years. If you check with Ford they will tell you the 2014 Mustang is the 50th anniversary edition. I actually have yet to see a “50th Anniversary Edition” of the mustang, I know they did a 45th, and a 40th, and probably a 35th but I’m not sure on that last one. Last I checked (ford.com as of right meow) the 2014 does not have an anniversary edition that you can buy, and the 2015 hasn’t announced any model names so we don’t know if they will have one or not. So my question is where did you hear about the 50th anniversary edition, and do you have a link you can share? The 50th Anniversary of the mustang is April 17th, 2014, but no special editions have been announced yet, just the new design to coincide with the 50th anniversary of the Mustang. I have seen news articles say that the new model is the 50th anniversary edition, but they are saying that because it will probably be sold 50 years to the day after the first one. Does that answer your question or cause more confusion? at the bottom it says that all the 2015 cars will have a 50th anniversary “special notation” but I don’t know how accurate that is being it is the only place I have found it. Yes it’s confusing at best but ALL 2004 Mustangs had the 40th anniversary badges and I believe that goes for the 99 mustangs and the 2009 Mustangs. So Ford seems to recognize the beginning as 1964 even though they were all VINed as 1965 cars. Looks to me much to do about nothing. Ditto with GM’s new 2014′ pick-up line. The Silverado and Sierra are minimally changed. Agree with Rickycardo and Daniel Timm…I was looking at a 2014 but now will ignore them and wait for a 2015! IRS w/ more growl/throat from the GT/Shelby/??? top end exhaust…nice! How about a 550+ engine to roll-out the 50 anny and new body style?? ?